Runner’s World published a breathless piece on the Amazing Growth of Running Over the Past Decade. The number of Americans who run at least 25 times a year has grown by 60% since 2004. Yowie zowie. There’s power in numbers, fer shure. More of us must mean we’ve got a lot more … hm … what?. I know I’m being a grouch. But really, I don’t care if there are 19.5 million runners, I just hope every last mother’s son of us is happy. I don’t like runners in crowds, just as I don’t like “governing bodies,” and runners’ associations, and runners’ magazines that tell us what to do. As far as I’m concerned, they’re products of a mentality that imagines good things get better en masse and with organization. Well, maybe they get bigger. But better? I’m not so sure. I think sports are best when they’re focused on the individual. To my mind, two individual runners make two separate people who can achieve wonderful things, each at their own level. I met Jobst Brandt when I edited Bike World, a short-lived Runner’s World sister magazine that got inhaled by the Rodale magazine empire when the publisher needed funds to pay off his divorce settlement. 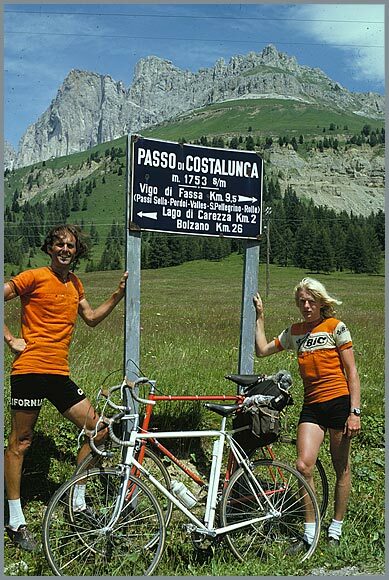 In the late summer of 1975, Jobst invited me to view the photos of his annual cycling trip in the Alps. That evening, I showed up at his comfortable Palo Alto bungalow, where he and riding buddy Bill Robertson regaled me with their adventures. Jobst’s trips were the stuff of legends. The highlight of the outing was a single day’s ride that climbed twelve major Alpine passes. The photos, fresh from the camera shop, showed the pair at the start, both smiling. 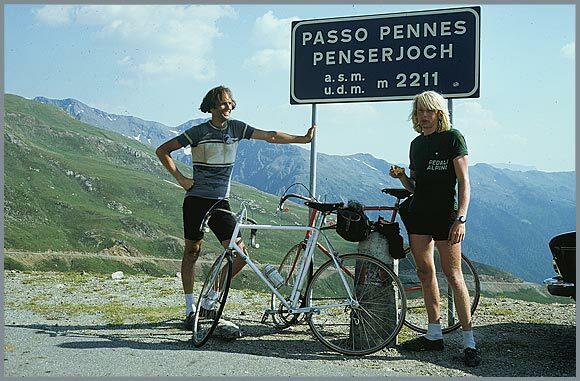 At the top of each pass, a photo shows the ever-beaming Jobst and an increasingly wilted Bill. Poor Bill – my legs twitched as I imagined his suffering. Nobody could match Jobst when it came to riding long and climbing hard. He was in a class by himself, a superhuman athlete, born with alien DNA. Jobst was very friendly, although in cycling circles he had the reputation of being a bit of a grouch. Not the stupid kind, mind you; he had degree in mechanical engineering from Stanford, where the department is rated among the world’s top three. He enjoyed a very successful career with major companies, including Porsche and Mavic. The thing is, Jobst was objective as few people could be. If you asked him why a bicycle wheel should be built a certain way, you’d get a solid, well-researched, detailed, calmly delivered and generous answer. But woe unto to you if you clung to childish views based on mere opinions. Jobst lived outside the cycling mainstream. His energy was high-amperage and he had a boundless, quiet enthusiasm. He reminded me of Joe Henderson in that way – he was at his best on the road, riding with big energy and a big smile. 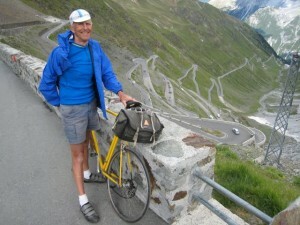 It wasn’t that Jobst couldn’t race with the crowd; he was a heck of a cyclist. He was fair-minded, believing that bicycles shouldn’t be cleverly designed so the winner wouldn’t necessarily be the best athlete. How good was Jobst as a cyclist? He could out-ride them all, probably including the top U.S. racing cyclists and most of the European superstars. He routinely rode hard over the Santa Cruz loop – a 70-mile, largely mountainous jaunt that included a hellacious ascent on Kings Mountain Road, a climb that always made me want to fall off the bike and expire. His fitness came from great genetics and consistent 10,000-mile years – about 200+ miles per week for a very long time, much of it on extended hard rides. I love his views on Big Sport. I think it’s fine that the number of runners is growing in America. I like to think we’re the world’s fittest country, even if we’re also the fattest. But the stats ultimately leave me cold. I think they’re symptoms of a disease. We’ve been obsessed with “objective figures” for a long time in the West. I think it’s time we woke up to another side of life. We’ve gotten out of balance, living too much in our heads. 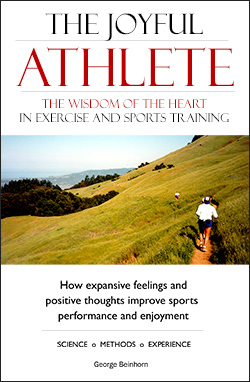 I’ve become aware that my running and cycling go best when I balance head and heart. 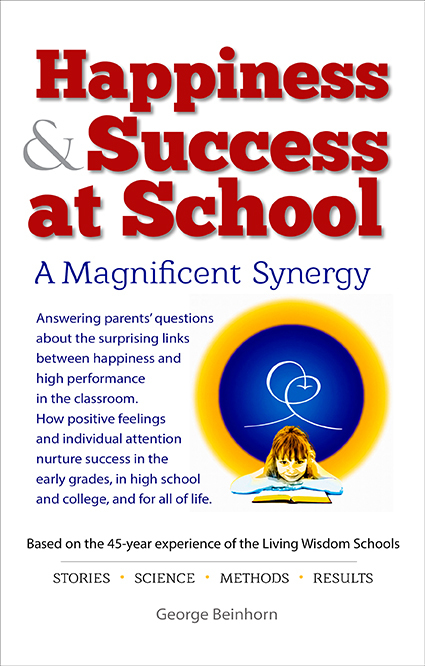 I get in fair trouble when my head sprints away, pushing to “make the numbers.” I’m better off, in enjoyment and progress, when I let go and become centered in the moment, feeling what’s trying to happen. I don’t think it hurts that I’ve meditated every day for 48 years. There’s a cool, calm, sweet place inside where the outside stuff doesn’t matter. When I worship in that place, celebrate it, renounce outward goals and let it guide me, it’s strange how much solid enjoyment I find, on the bike or while running. Oddly, I often end up reaching my destination faster. Alan Watts, the writer and speaker on Asian religions (1915-73), told a story of a Zen master who welcomed a group of American tourists to the monastery. Spontaneity isn’t a bad thing, in the spiritual life or in sports. My spiritual teacher loved the story of a man who lived on an island in the South Pacific during World War II. An American soldier saw the man walking on the beach one day and challenged him to a footrace. He readily agreed. “Ready – set – go!” the American yelled and dashed down the beach. Meanwhile, the islander sauntered casually to the finish. “No, you didn’t,” the local man replied. “How so?” the American said, puzzled. I think athletes like Jobst Brandt are treasures. By going their own way, they open fresh vistas for us all. They include people like Chris Severy. The University of Colorado superstar runner rode his bike everywhere. Chris severely pissed-off the “serious cyclists” by jumping into races on his ratty 10-speed, attired in cutoff jeans, and winning. “I think my advocacy (of cycling) should be evident from my ride reports. These reports are not filled with arduous hardships and suffering, but rather the beauty of the places and people I encounter. I think that is what life is about and many people have followed these trips. As I ride here and in the Alps, I am often greeted by name from people I don’t know…. I borrowed the Jobst quotes in this article from an entertaining interview here. This page collects Jobst’s thoughts on things cycling. And here’s a fine gallery of photos from his Alpine tours.